If the idea of experimental or innovative short stories makes you squirm, even though you are simultaneously bored with more traditional structure, Not Anyone’s Anything belongs on your bookshelf. 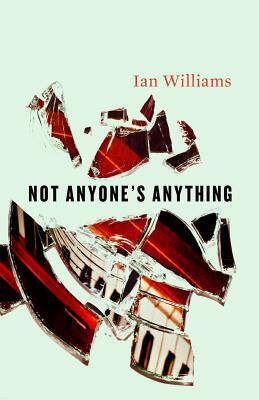 Ian Williams puts relationships at the core of his work and this fiction collection exhibits this tendency as well. I also wholly enjoyed his poetry collection You Know Who You Are, which opens, you might have guessed, with an epigraph from Alice Munro’s Who Do You Think You Are? and behaves, in some ways, more like a conversation than a collection of poems. The stories in this collection reverberate within and throughout, seem to call-and-answer in an unusual and compelling manner. Stylistically this is an exciting project as the author’s playfulness extends not only to trios of trios of stories, which reflect and refract, but to forms which shift and expand as the reader turns the pages. Lines are drawn, for instance to afford the possibility of simul-reading two characters’ experiences on the same page (i.e. one person’s perspective on the left-hand side and the other’s on the right-hand side) or to align two experiences of the same narrative space (i.e. a horizontal line separating the characters’ experiences until they inhabit a shared space). But these lines are inclusionary and engaging, rather than isolating and pretentious. Musical staves or Korean language study-cards: you might not be able to predict the contents of an Ian Williams’ story, but loyal readers will know you can predict the degree of satisfaction which settles upon reading. Personals examines the ins and outs of coupling. Ian Williams charts the landscape of attachment and detachment. But before the reader discovers the contents of the collection, there is the striking wrapping to study. (I can’t stop staring: design by Natalie Olsen.) Including charming endpapers. And Ian Williams is a designer too. The shape of his poems is remarkable. And sometimes the shapelessness, too: the way that lines wrap and turn, rather than simply end. Sometimes a verse is all about what is said and what has been said and what is still being said. And sometimes what it is not spoken speaks louder than words. Ian Williams’ works simultaneously challenge and invite, and sometimes the silences resonate as loudly as the words. Curious? His website is here. You always read such wonderful-sounding books that I have never heard of before! 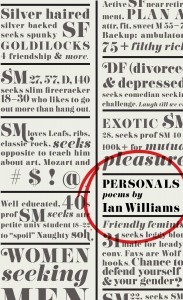 I have never heard of Ian Williams, but I’ll definitely check him out next time I’m in the mood for poetry. I love the shape of his poems, as you say! The verses are immediately accessible, so even if you are not in the mood for poetry very often, I’m sure you would like these, Aarti! Because I like full novels better than short stories (usually), and I only have so much time, the stories always get put on the back burner. But, there are so many I want to read! I loved The Summer of the Canadian Short Story (or whatever it was called) – I got 3 collections read that summer, and loved them all. I was going to do it again this summer, even if Write Reads didn’t come out to play, but I guess I needed a host to kick me into gear. Sigh. I understand completely. They didn’t always get a spot in my stacks either. Have you seen the advent calendar being published this year with a CanLit short story for each day? I don’t have the details handy, but it might just be the perfect excuse for you! Yes, I saw that! Very tempting, and such a good idea, but it’s $55, and I was thinking I could make my own with all the short stories I have here. In fact, I could make mine go as long as I want…hmm. That, too, is a terrific idea. Have you started your “line-up”? Lists about reading…. I can understand that; I do love her writing too, and so perhaps that increases the likelihood that you would enjoy Ian Williams’ work as well. I love Ian Williams! Glad you like his work so much. I do: I also love that he makes me love it, despite my relative unfamiliarity with poetry and experimental fiction!